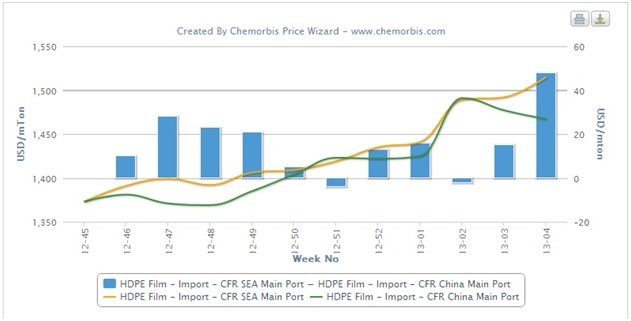 SEA’s PP and PE markets have remained firm over the past few weeks even as prices to the nearby Chinese market began to soften with the approach of the Chinese New Year holidays in February, as per the pricing service of ChemOrbis. Players report that demand is holding steady in SEA and sellers remain confident of their ability to achieve price increases in the coming days. 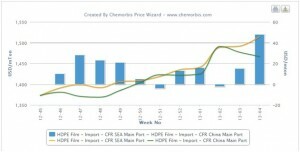 Throughout most of November and December, homo-PP prices on a CFR SEA basis traded with a slight premium of around $10-30/ton when compared with homo-PP prices on a CFR China basis, according to data from ChemOrbis Price Index. However, the premium Southeast Asia carries over China has been steadily rising for the past three weeks and currently stands slightly above $80/ton. A trader in Vietnam commented, “We received homo-PP prices from Saudi Arabia, India and China with $10-20/ton increases this week. We have 200 tons of material in stocks and are confident that we will be able to sell these cargoes at higher prices in the weeks ahead.” A woven bag converter in Indonesia said, “Import PP prices continue to firm up this week as supply is limited and sellers are taking a firm stance on their prices.” Import HDPE film prices on CFR SEA basis also traded with a premium of around $10-30/ton relative to CFR China prices during much of November and December 2012. However, the premium carried by CFR Southeast Asia prices over CFR China prices has been steadily gaining ground for the past two weeks and now stands just under $50/ton.